What I absolutely love about this salad is it combines the heartiness of Brussels sprouts and lightness of a salad all in one. Two perfect combinations in a single bite. The fact that this dish is super easy is also an added bonus. Generally I pair it with a steak or pan seared fish. I can start the salad, shredding together the Brussels sprouts and olives then toss with oil, lemon juice and other ingredients, letting it marinate a bit while I prepare the rest of my meal. With the dried cherries, it’s even Whole30 compliant! An easy dinner and side, all in less than 20 minutes. This dish has become part of our regular rotation, sometimes making an appearance more than once in a single week. I dare you not to fall in love. Slice Brussels sprouts in half and shred them using your food processor. 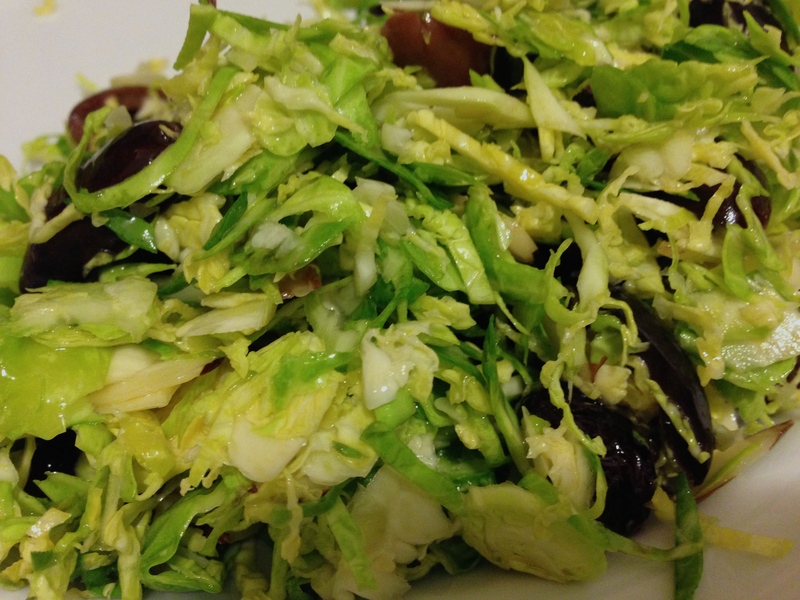 In a large bowl, toss Brussels, olives, cherries and almonds. Drizzle with olive oil and lemon juice, tossing again to combine. Season with salt and pepper to taste. Let salad stand for 20 minutes and give another quick toss before serving.